A 42-year-old Japanese woman with a body mass index of 42, presented with a long history of bilateral swelling of buttocks and lower extremities. The upper trunk, upper extremities and feet were spared of excessive fat deposition without a complete loss of adipose tissues (figure 1), lowering the likelihood of partial lipodystrophy. Physical examination revealed that the edema was dry, hard and non-pitting. Stemmer’s sign was negative, and five out of seven criteria for the diagnosis of lipoedema1 were met. A CT scan showed massive circumferential enlargement of subcutaneous tissues with the same CT value as fat, further suggesting the diagnosis of lipoedema (figure 1). Other conditions causing lower-extremity swelling or fat excess were excluded. We performed skin punch biopsy of the right hip (figure 2). Chief pathological findings were as follows: (1) the size of adipocytes was generally large (with a diameter up to 100 μm); (2) the contour of adipocytes was maintained, but with membrane breakage; and (3) infiltration of plasma cells or lymphocytes typically observed in lymphoedema was scarce. General appearance and CT scan of the lower extremities. Histology of adipocytes with H&E. 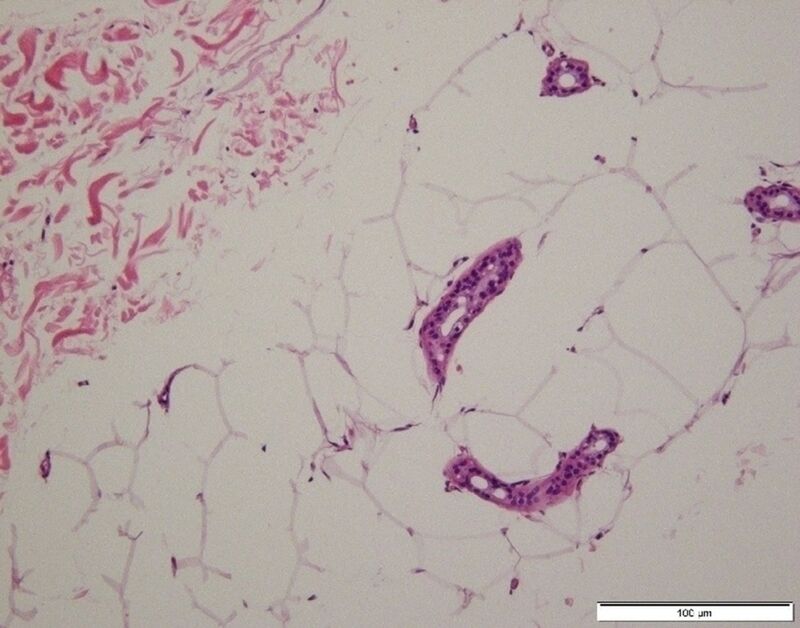 While the diagnostic pathology of lipoedema has not been established, hypertrophic and hyperplastic adipocytes are common pathological features.2 We presume that hypertrophic and ruptured adipocytes in our specimen highly suggest a rare case of lipoedema in Japanese woman. Unexplained bilateral leg swelling presents potential diagnosis of lipoedema. Skin punch biopsy may be helpful for the diagnosis of lipoedema.
. Lipedema of the legs: a syndrome characterized by fat legs and edema. Ann Intern Med 1951;34:1243–50. Contributors HK is an attending physician during hospitalisation and in charge of drafting the article. TT is the doctor in charge when the patient attends our hospital as an outpatient and he polished the article. KI is the head of our department. He gather everyone together and argue about the patient to achieve a correct diagnosis and treatment. He also had final approval of the article to be published.